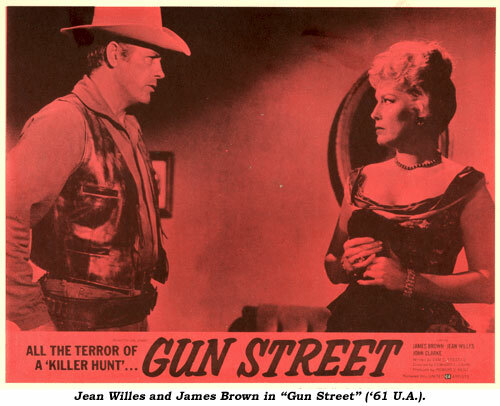 With the look of a gal who’s been around all the corners, Jean Willes’ sly, hard-boiled ladies jazzed up dozens of TV westerns, comedy shorts and cop dramas from the ‘40s to the ‘70s. Usually gaudy and cheap, Jean’s brassy, curvaceous blonde (sometimes brunette) was scattered all over the TV landscape as well as the movie screen during her heyday. 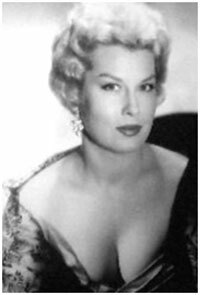 Jean played everything from golddigger to emasculating wife; prostitute (with or without a heart of gold) to party girl; gun moll to tough-as-nails saloon broad. A forceful, even intimidating, presence at times, Jean was a durable actress but somehow remained, for the most part, in the B-ranks despite her talent. She was certainly capable of much more than she was usually allotted in her 33 year career. Jean was born April 15, 1923, in Los Angeles, CA, to William and Velma Willes. Her father, a naturalized citizen, was a druggist (as was his father) and her mother was a public school teacher. Jean was raised in the Mormon faith around Salt Lake City and Provo, UT, before settling with her family in Seattle, WA, where she eventually attended the University of Washington, majoring in dramatics. Interested in acting, she returned to L. A. and joined a Little Theatre group. Her first screen role was as a model in a Harry Langdon short, “Beautiful Clothes” in ‘42. Movie roles in “So Proudly We Hail” (‘43) and “Salty O’Rourke” (‘45) followed. Columbia signed Jean in ‘45 and she became a staple in their comedy shorts opposite The Three Stooges, Andy Clyde, Hugh Herbert and others, including a couple of Blondie features. During this period she was often billed as Jean Donahue (possibly a name Columbia selected.) By 1948 she became Jean Willes and remained with her own name. By 1950 Jean became a standard cheesecake fixture in Hollywood—appearing in seven movies that year and as many comedy shorts. In ‘51 Jean married Gerard Cowhig (born 1921) of Boston who had been an All American fullback at Notre Dame and later played for several NFL teams including the L.A. Rams (‘47-‘49), Chicago Cardinals (‘50), Philadelphia Eagles (‘51) and the San Francisco 49ers. He retired in ‘52 to become sales manager for an L.A. freight company. The couple was introduced by Jane Russell, Jean’s closest pal, who was married to a teammate of Cowhig’s on the L. A. Rams. The couple had one son, Gerard (Jerry) Cowhig, born in 1954. He died in 2001. 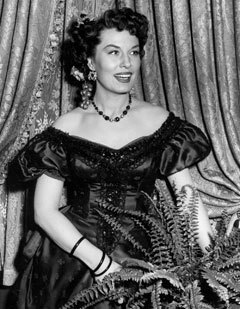 By ‘52 Jean had moved solidly into TV work, and made her first “western”—as Penelope, Bob Hope’s Harvard girlfriend in “Son of Paleface”. Other westerns followed on TV (“Range Rider”, “Rin Tin Tin”, “Tales of the Texas Rangers”, “Stories of the Century”, “Wyatt Earp”, “Man Without a Gun”, “Tales of Wells Fargo”, “Gray Ghost”, “Trackdown”, “Colt .45”, “Frontier Doctor”, “Rough Riders” [as Belle Starr], “Californians”, “Texan”, “Zorro”, “Tombstone Territory”, “Yancy Derringer”, “Wanted Dead or Alive”, “Maverick” [again as Belle Starr], “Wichita Town”, “Bat Masterson”, “Deputy”, “Wagon Train”, “Westerner”, “Lawman”, “Bronco”, “Cheyenne”, “Temple Houston”, “Virginian” and others). On theatre screens she was seen in “Masterson of Kansas”, “Count Three and Pray”, “King and Four Queens” (opposite Clark Gable), “These Thousand Hills”, “Gun Street”, “Cheyenne Social Club” and an excellent role as another “good” prostitute, Rosie, in the often overlooked western “Bite the Bullet” (‘76) with Gene Hackman and Ben Johnson.